How Large Can the Platypus Grow? What Is So Special about the Platypus Tail? What Is the Easiest Explanation for the Platypus? If any creature superficially resembled the long-coveted missing link in the evolution of animals, it would be the platypus. Instead, this creature leaves the evolutionists scratching their heads, wondering where to put it on their tree of relatives. Though a mammal, it has characteristics of birds and lizards. For example, the platypus lays leathery eggs and yet it suckles its young. It lives in burrows and finds food in the rivers using electrical impulses, similar to some fish. The male platypus has a ½ inch spur on his hind legs that can inject poison like a snake. It has a very sensitive bill like a duck but feet like an otter. In fact, the name platypus means flat-footed. The platypus is found on the eastern coast of Australia but more common in the south where flooding and crocodiles are not as common. The female breeds at age two but may not do so every year. The platypus grows to about 20 inches and can live for up to 12 years in captivity. The tail of the platypus somewhat resembles that of a beaver but is really quite different. The beaver’s tail is flatter, broader and covered with special scales, and it is used to help the animal build dams and warn of danger. The platypus’ tail is mainly made of a fatty tissue that is used to store energy supplies for times of need. The top is covered by coarse hairs, whereas underneath there is only a sparse growth of hair. 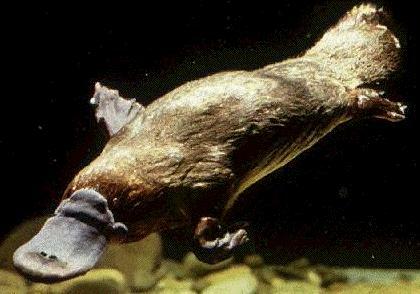 Unlike the beaver, the platypus uses its tail only for steering while swimming. The front feet of the platypus are webbed, suited perfectly for swimming by alternately kicking its front legs. Yet the claws look more like those of reptiles. The hind legs are only partially webbed and act as steering rudders. Out of the water, a beaver is awkward and clumsy. Not so with the platypus. When out of the water, its webbing is folded under the animal’s feet that are then ideal for digging. Since this creature is found only in Australia, evolutionists have surmised that it is the result of cross-breeding with close relatives. Yet, the ideally suited characteristics resembling a variety of animal classes defies such an explanation. Again, it is easiest to believe what God said, that He made the platypus in the beginning as it is, another perfect example of His creative genius! this has helped me understand a lot better on how the platypus represents Gods creation. i was worried that the platypus helped evolution.